The BMW Lifestyle womens stainless steel watch with dark face dial. The BMW Lifestyle womens watch features a brushed stainless steel 42mm case and original Swiss movement for ultimate precision. 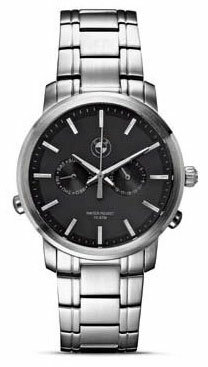 The face of the watch features a BMW logo and a day dial, as well as date. The stainless steel bracelet has a folding metal clasp, and a laser engraved BMW logo on the back. Water-resistant to 340 feet.